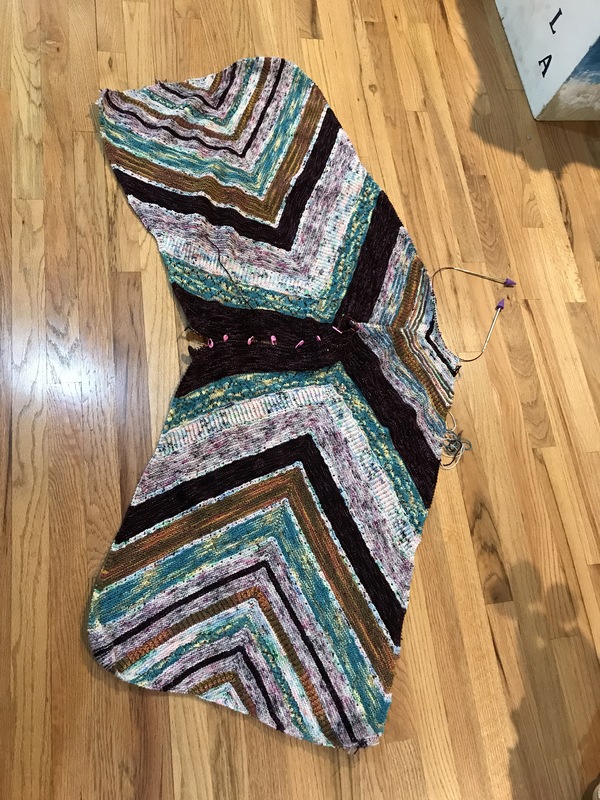 Starting point Shawl – knit 600 stitches per day. I want to be halfway through the first joining triangle this week or 25% through the final clue. Actually it would be great to be at 30% or more so I can be on track for finishing a bit early. Secret Project #3 – Start the next one. My goal was to create 3 of these but I’m going to stop 11/30 so I’ll be in the middle of the third one. I’ll start up again in January and ship this off when it’s done. I started the 3rd one and stopped working on it as soon as December hit. But I felt weird having this thing started and sitting there. I started working on it again over the weekend and will work on it as I feel like it. I’m not adding any pressure on myself to finish it. I will be happy if it gets done but it doesn’t have to get done. I’m taking this off this list as it’s not something I need to get done. Mama’s Bukid – Page 5, Row 4 – finish Row 4 and at the rate I’m going possibly get through half of Row 5. I was only actually able to work on this once this week so I didn’t get finish with Row 4. It’s almost done but will be on this week’s to do list. St. Patty’s Socks and Secret Mandala sock blank that I’m knitting up congruently – I only have a few rows left working the back of the heel, my goal is to get that done, turn the heels and then pick up the stitches. This week, I want to get my socks to the point where I can work on the foot. I’m not going to get this done this month but I want to get them done in December. That will complete my 12 socks for the year and I can start again in January. I’m working on decreasing the gusset to start on the foot. I’ve got about 5 decreases left on St Patty’s Sock and 10 decreases left on Secret Mandala. I think I can get those done in the next couple of days and get started on the foot. Harry Potter – continue to work on this as I have time. I am working a bit on this. Finish Clue #1 of On Ringo Lake and work on Clue #2 on Friday. I didn’t get Clue #1 finished so I packed that up with a post it note and put it in my On Ringo Lake project bin. I started working on Clue #2. My goal is to work on clue #2 twice this week. Starting point Shawl – Continue knitting 600 stitches per day. I want to be 75% through the final clue. St. Patty’s Socks and Secret Mandala sock blank – finish the decreases and start the foot. Harry Potter – knit 2 rows per day. On Ringo Lake – piece 12 geese per day until Clue #3 is released.